I wish i would have taken a picture of the spices in the spice market, but it's always so crowded i didn't want to make a fuss. but i was able to catch this one at the olive vendor. 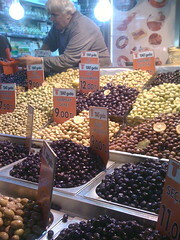 i HATE olives, so i am disgustingly facinated by all the options.